Are Instagram Ads as Effective as Facebook Ads? 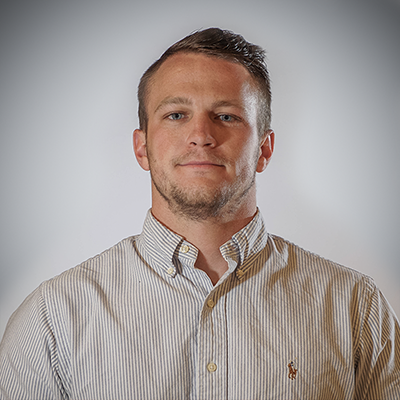 In digital marketing and inbound marketing, no single strategy is ever set in stone. We're always testing different variables throughout various campaigns; optimizing and adjusting subject lines, timing, tone, and visuals to measure how the ever-changing audience reacts. In the past few months, I've noticed some of my own digital behavior as an audience member change; I've started to make purchases after seeing a product on Instagram. As any digital marketer who's worth their salt would do, I want to see if my actions are part of a larger trend. In the following experiment, my goal is to determine if Instagram is as effective as Facebook in driving sales online. I've already laid the groundwork for this experiment in a previous blog; it's now time to build the ads. To recap, this experiment will use my existing Shopify account that sells clothing made from 100% recycled materials. This will test whether Instagram is a viable advertising platform for an eCommerce site by examining traffic, conversions (purchases), and overall ROI. 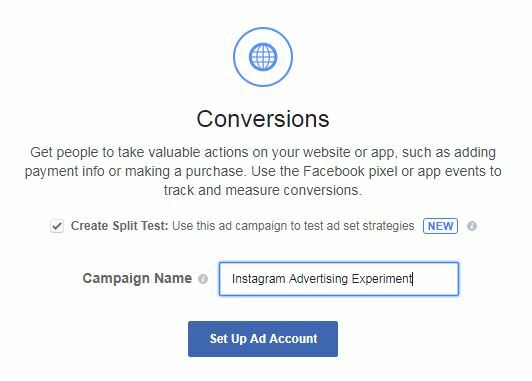 I'll be running two ads, one on Facebook and one on Instagram, and utilizing Facebook's Split Test feature to compare and contrast. The ads will feature the same images and copy and will be displayed to the same audience, with identical demographics, interests, and purchasing behavior. The only difference will between the ads is where they are placed. 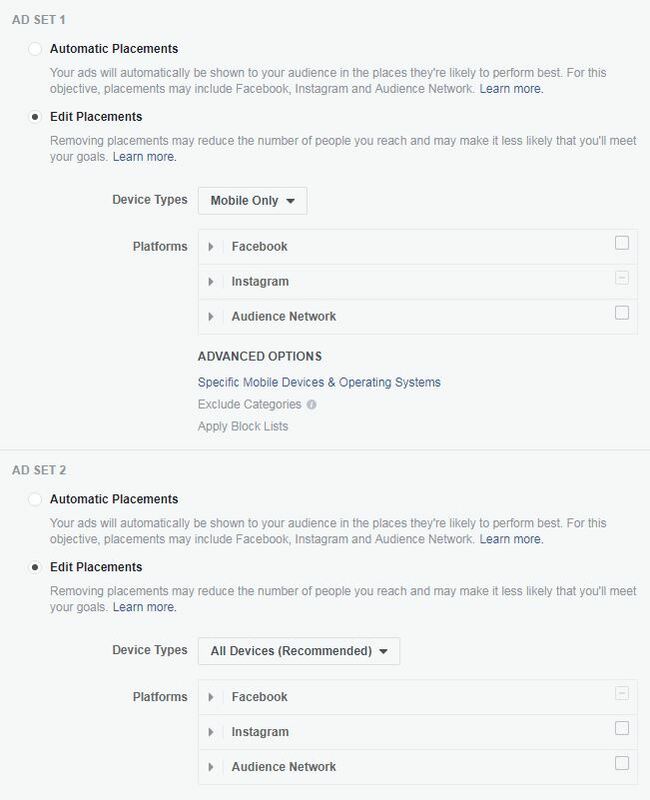 To create my ad, I logged onto Facebook and navigated to the Ads Manager by clicking the upside-down triangle in the top right and selected 'Create Ads." On the next page, I selected "Conversions" from the 'What's your marketing objective?' list. I chose Conversions instead of Product Catalog Sales because I don't have a product catalog set up and I already have my Facebook Pixel installed to track checkouts. Ad Tip: To select Product Catalog Sales you must have a Products Catalog set up. If you plan on running extensive product-based Facebook Ad campaigns, it's worth looking into whether a Catalog is worth your time. Underneath that, I chose to create a Split test. 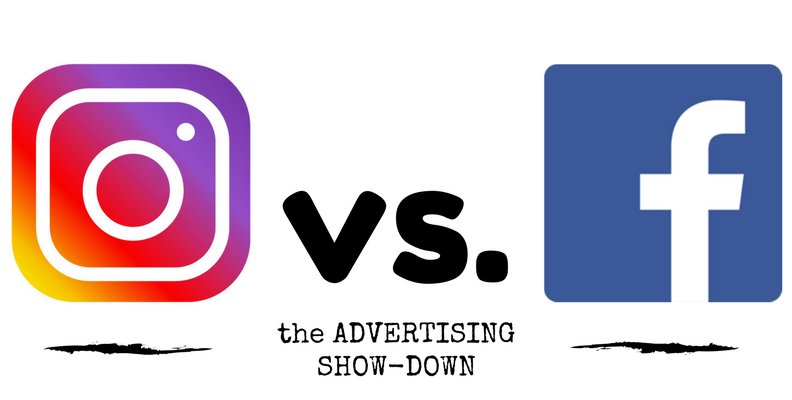 This allows me to easily compare my two ads and see the performance differences between Facebook and Instagram. I was prompted to choose a Facebook Pixel to make sure I get complete data on what users do after they visit the site from my ad. If it's not already installed, it's easy to create a Facebook pixel and place it on your website. Lastly, I chose the conversion event of "Purchase," but there are many other events to choose from based off of your objectives. The Split Testing feature makes it very easy to test different variables in an effort to determine what ad settings work best for your business. There are three variables you can choose to experiment with. After you've decided on the variable to test, the other variables should remain constant for a clean experiment. Facebook Ads have gained a successful reputation, but Instagram is unproven on a wider scale. My interest in testing between the two makes the placement variable the best option for me. Within the placement variable, I chose "Edit Placements" to make sure I get one ad on each platform. Facebook has collected an abundance of data about its users, which translates to copious ways to target them with ads. In this experiment, I only touch the tip of the iceberg because I have little data to suggest who's the most interested in buying my product. Knowing the limitations of my small eCommerce store, I kept my audience's location to the United States because we're not equipped to ship overseas just yet. I also chose to display to men and women aged 18-50 until I have more data. After running multiple tests, I'll be able to narrow down my audience based off of historical data. Ad Tip: If you target a very specific audience, you want your ad language to reflect that. I don't want this to be a complete shot in the dark, so I did narrow down my audience to only include those known to purchase from online stores and who have interests similar to my value proposition. This helps me avoid the people who still mail in their orders to Sears Roebuck and wait 8 to 10 weeks for delivery. I also want to sell my products' value proposition, 100% recycled clothing, so I chose to display the ad to people who are interested in green living or sustainable activities. Since the store's social following is small, I did not refine the audience by Connections, or those who like my page or follow my account. It's time to create the ad that will be displayed. The chosen ad format will be the same on both platforms because it is one of the variables you want to remain constant. Ad Tip: Make sure your Instagram account is linked to your ad account. This adds an extra layer of validity and gives you the chance to gain followers as the ad will link back to your profile. Type of Ad: I chose to go with the Carousel. This lets me show the different options we have; men's and women's, short sleeve and long sleeve. Viewers are able to scroll through 3 or more pictures and choose to shop the category that most interests them. I also have space to show photos of the product in action. Tone: The tone on my website is typically lighthearted and humorous, but this ad will be displayed to a wide demographic range so I kept the tone straight to the point and made sure to include the value prop. I also noted that everything is on sale. Imaging: I chose to show product and action shots, always with someone wearing it. Humans like to see other people and nothing is more boring than a product in bland surroundings. Take advantage of the platform preview drop down to see how your ad will look when live. Call to Action: The Call to Action is the most important part of your add. This is how the viewer will be able to access your site and ultimately convert to a lead or customer. I chose the "Shop Now" button; I want my viewer in the shopping and purchasing mindset from the moment they click on the button. As a last double check, make sure your pixel is installed and active by verifying that the dot next to it is green. My Ad set is now set up to test between Facebook and Instagram! With all the buzz around Facebook Ads' effectiveness, I'm giddy to see how my Instagram Ads perform. This experiment, which anyone can do, will me understand what kind of social advertising channel is best for my business. Stay tuned to see the results!